Over the past 14 years I’ve had six tattoos done… nothing big, nothing colour, so it’s fair to say I’m not the most experienced. 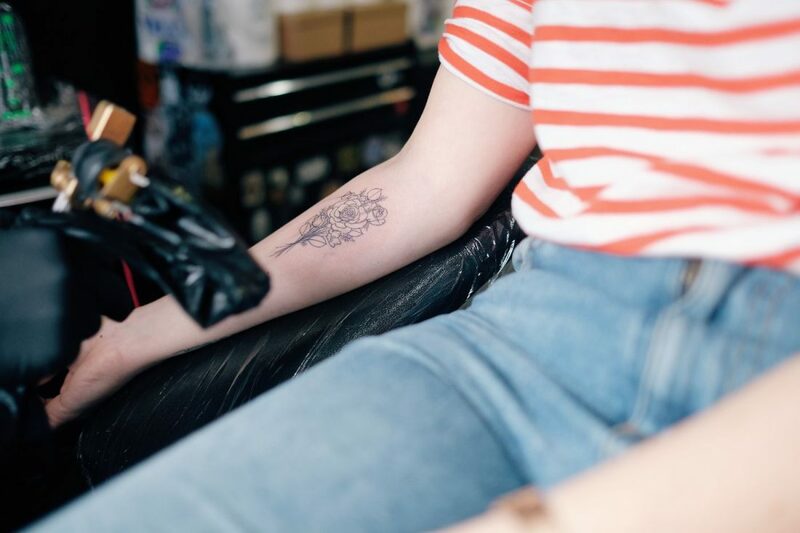 But I do still have a few thoughts and learnings that might come in handy if you’re thinking of getting some ink done yourself – is that how the cool kids say it? I was 16 years old and feeling a bit rebellious with my fake ID so I went with my ex-boyfriend to a place in Camden and got a treble clef on the back of my right hip “because my family and I are really musical” *eye roll*. I almost passed out and had to lean out the window where one of the tattooist was standing outside smoking something suspicious, luckily it was over pretty quickly. I wore my low-hung jeans and cropped vest tops every day to school to show off my new tat. I loved it. I was 18, I’d been travelling the world for three months, again with my ex and I got the itch for another tattoo in Thailand. I’d heard some bamboo tattoo horror stories so the sensible version of me decided to get it drawn in Thailand but take the design with me to get it done in LA on the way home. Hmmm, what do I want? Well getting my own name seems a little self obsessed, I guess my name is technically a flower, so maybe I should get the word “flower” in Thai? *double eye roll* I found a random tattoo parlour on Sunset Boulevard, opted for the inside of my ankle as it felt less obvious than the outside and that was that. Done. I was at University, maybe 20 or 21 years old and I found myself doodling on my wrist during lectures. I was into stars and once I got it into my head, that was it! I didn’t really know anywhere in Birmingham so I went home to London one weekend to get it done at a place called Lal Hardy as it was meant to be a big deal. I got a large star that was double lined and then two smaller stars either side. It didn’t heal amazingly and now I know it’s because you’re not really meant to tattoo above the lines on your wrist but stars are pretty classic so they’ll never really date which is good. 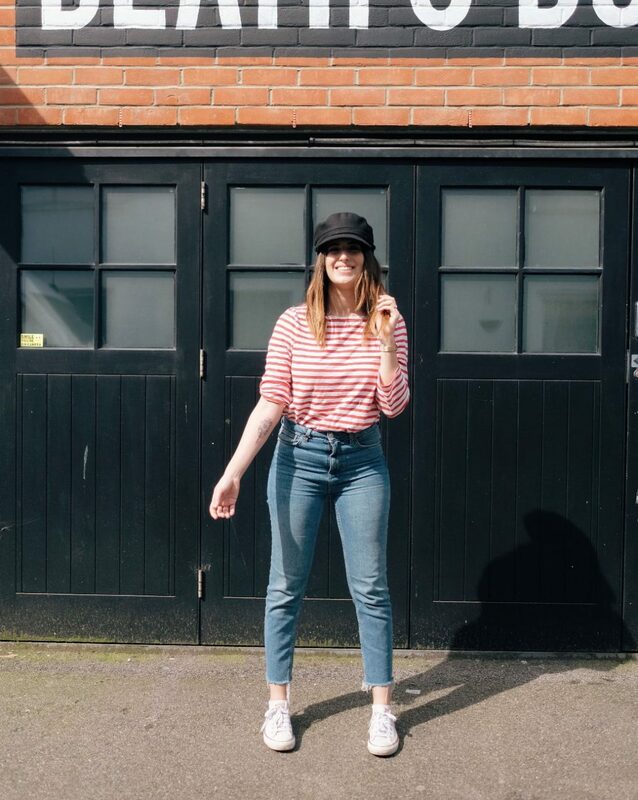 I was 24 years old, I’d just quit my job to start blogging full time and I was feeling full of life. I went to The Family Business to get “New Kid in Town” written on my wrist. This is probably my only tattoo that has some meaning behind it as it was the Eagles song that was playing when I was born. It’s a band that will always mean so much to me and I love the title of the song. Only a couple of years later, when I was 26 I quite spontaneously went back to The Family Business and got another tattoo that I stupidly booked in for the morning after one of my best friend’s hen. I wanted two arrows on the back of my arm, I can’t remember there being any real reason other than that I liked the idea. The hangover made the pain worse and I didn’t have the confidence to ask the quite impatient man tattooing me for it to be made smaller and so I ended up with a bigger tattoo than I’d hoped for. I do like it though but as I can’t see it, I kind of forget that it’s there. After falling in love with Gee’s designs I (again) quite spontaneously got a last minute appointment with her to have her trademark flowers tattooed onto my forearm. I specified the type of flowers I liked but for the first time was quite free in trusting the artist to create something. It’s the most obvious place I’ve had one to date, but I knew it would be gorgeous and I wanted to be able to enjoy it for myself. I think as time moves on there will always be an improvement in the way tattoos look, due to the new types of needles they use and the developed skills within the industry so there’s no getting away from tattoos that look a bit outdated. My older tattoos are much thicker than my newer more delicate ones because back then, fine lines were harder to achieve with tattoos. So I don’t worry so much about that as it’s pretty difficult to avoid. But one of my biggest learnings is more to do with the process of finding the right person to do your tattoo. I’m talking from my own experience here and not on behalf of others but I think often we get so obsessed with thinking about what tattoo we want that we forget about the fact that these people doing them are artists. It’s such a balance between knowing what you want on you for the rest of your life, and being trusting enough to let the artist create something probably better than you can. Until I met Gee, I honestly disliked every single tattoo experience I had. I don’t mean to generalise, but they were all men and every single one made me feel rushed, intimidated and inexperienced. 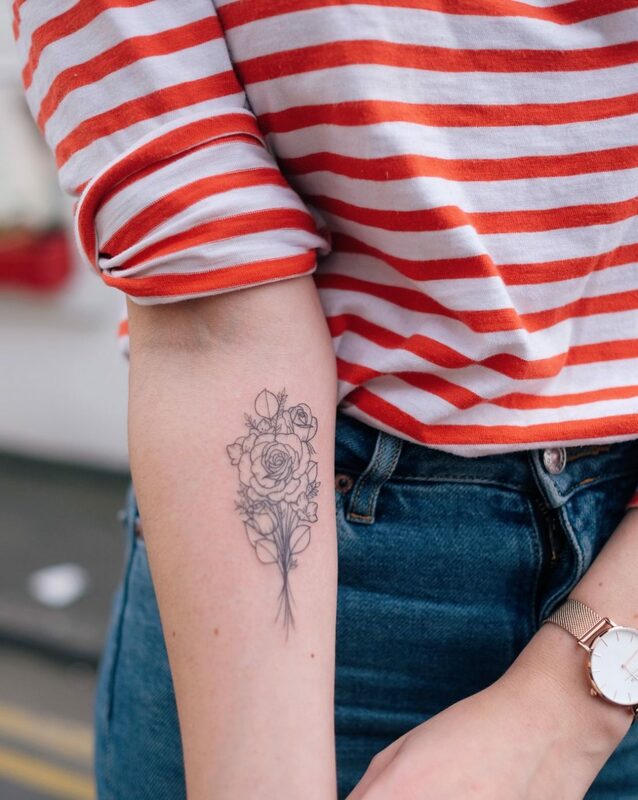 I’ve said for years that there’s a gap in the market for a tattoo parlour for either first timers or for people who have just a few small tattoos… because it’s different, it just is. Often tattoo artists won’t draw the design for you ahead of time to think about it because they’re worried you’ll take the design elsewhere to be done. So you arrive on the day, you’re shown a design and unless they actively say “don’t worry, take your time and any changes you want to be made can absolutely be made”, you feel really guilty and embarrassed asking them to change things. There’s a pressure, a time constraint and I’ve many times in the past been told “no, that’s the best I can do”. 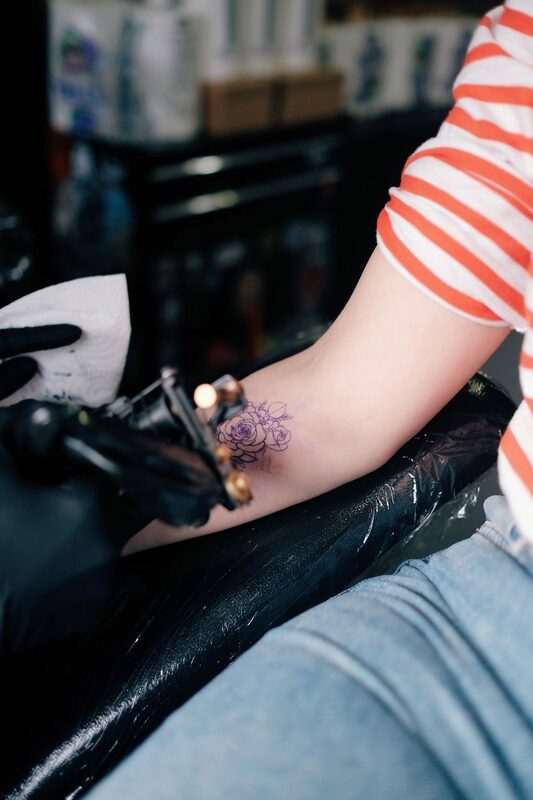 In the past I’d paid deposits, booked appointments months in advance and it doesn’t feel easy to stick up for yourself, especially in an environment that feels alien to you (most the tattoo parlours I’ve been to are quite scary inside). Because of all these factors, it’s difficult to find someone you trust, therefore you arrive with a prescribed idea of what you want and it often won’t turn out the best. Instead, this time round, I found Gee first and it was her style of tattooing that inspired my design. 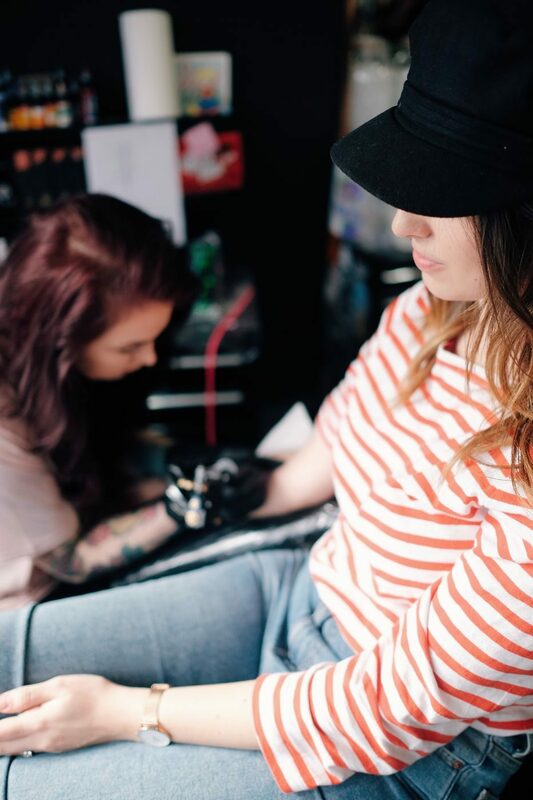 Because of that, she could tattoo to her best ability and really show off her skills, instead of forcing her to create something she doesn’t feel comfortable doing. It’s difficult to find the right artist for you, but Instagram has made that a little easier. If you want text, find someone who specialises in font writing, if you want flowers find someone who specialises in flowers. You see the pattern here? I think if I could change anything about my past tattoos it would be to think more about WHO is tattooing me, not just WHAT I’m having done. Also, who says that your tattoo has to be deep and meaningful? That’s always the first question someone asks when you get a tattoo, “what does it mean?” or “does it represent something?”. Deep and meaningful tattoos are lovely, but they don’t all have to have a meaning. For me, getting a tattoo is more about WHEN I get it. 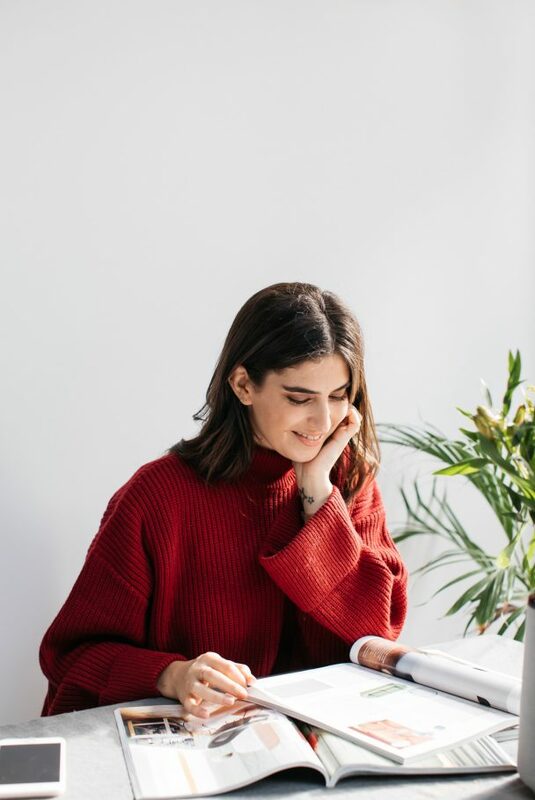 My first teenage love, travelling the world, going to University, quitting my job to blog full time, in the height of my twenties surrounded by friends, when I wrote a book and learnt more about myself than ever before…. each tattoo reminds me of a time and a feeling, who I was with and where I was. I remember once lying to someone and saying that my 3 stars represented me and my sisters, because saying “just because I like them” felt stupid. It’s ridiculous. Get whatever you want, there doesn’t have to be a reason, it’s your body. 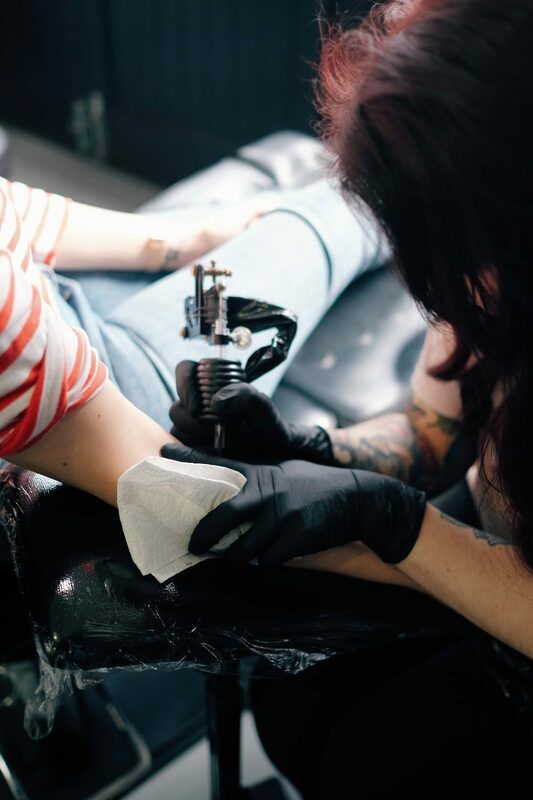 So 1359 words later and I’ve just realised this probably would have made a better video than a blog post, but I hope it helped some of you thinking of getting a tattoo or extending your collection. Tweet me any questions you might have @lilypebbles and I’m going to leave you with my final tip. Don’t overthink it. Just go for it. Yes it’s forever but life isn’t THAT long (sorry if that sounds depressing) and as Gee quite rightly said to me, “if, when you’re old and grey, all you’ve got to worry about is your tattoos, then you’ve done something wrong”.